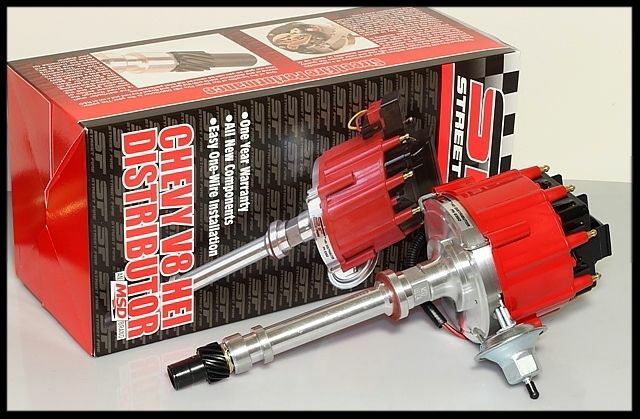 Do not purchase this distributor unless you are buying one of our sbc turn key engines. This is an upgrade for those that have purchased a Turn-Key engine from our other listings. To be perfectly clear, this ad is not for the stand-alone purchase of this item. This is an upgrade only available to customers that have purchased one of our sbc turn-key engines. Do not click the buy it now on this item unless you have an sbc turn-key engine already in your shopping cart. THIS ITEM IS LISTED IN OTHER LISTINGS AT FULL PRICE AS AN OUTRIGHT PURCHASE. Our sbc turn key engines come with a lower grade distributor. This is the optional upgrade. This is why the price is on this unit is lower than normal. We will not accept your purchase of this item unless you are buying one of our sbc turn key engines. We do offer this distributor at normal price in our other listings. NOTE: THIS IS AN UPGRADE FROM OUR REGULAR HEI DISTRIBUTOR TO THE MSD UNIT FOR THOSE THAT HAVE PURCHASED ONE OF OUR TURN-KEY SBC ENGINES. THIS ITEM IS LISTED IN OTHER LISTINGS AT FULL PRICE AS AN OUTRIGHT PURCHASE. Red with black coil cover. The shaft diameter on this distributor is .491 in. Coil included. Be sure you have sufficient firewall clearance. This unit is one full inch wider in diameter, and approximately one and a half inches taller compared to a point style distributor. If your car came equipped with an HEI unit, then you will not have a problem at all. The firewall tunnel on many point style distributor equipped GM vehicles may allow space for the HEI unit, but be sure before purchasing. COMPLETE DISTRIBUTOR: WITH COIL, MACHINED ALUMINUM BODY, STEEL SHAFT, GEAR, MODULE, AND PICKUP! THIS UNIT WILL FIT MOST ANY CARBURETED V-8 CHEVY ENGINE MADE EXCEPT COMMERCIAL/INDUSTRIAL 427 and 366 ENGINES. YOU CAN REPLACE YOUR POINT STYLE DISTRIBUTOR WITH THIS. THE DIFFERENCE IN PERFORMANCE IS DRAMATIC TO SAY THE LEAST. BRAND NEW IN THE BOX. FIRST LINE ITEM.